A cross-cutting overview of the EE-AoA results around the two key themes of the Astana Ministerial Conference leads to a number of key observations including commonalities and differences in a number of areas. Clearly, there is a margin of uncertainty arising from the methodology' s application given the impossibility of identifying and capturing in the process everything available at all scales and for all related themes and of reviewing all of these consistently. With these limitations recognised, the assessment and conclusions presented here are believed to be robust and pertinent for the objectives of this exercise. The characteristics of the problems faced by water and green economy assessments are not topic specific; rather, they depend on the underlying institutional make-up and approaches in countries and organisations across the MDIAK reporting chain (58). Similarly, common challenges are shared by different geographical regions. The EE-AoA has confirmed the validity of the AoA approach to very diverse themes, beyond the marine environment, underscoring its potential for being applied more broadly to address other environmental priorities. Additionally, the results are relevant to the international environmental governance debate globally, such as discussed at the 2011 UNEP Governing Council on the world environment situation and UNEP-Live (59). Water assessments are found at all geographical and institutional levels, while the Green Economy, as a theme still under conceptual debate, is mostly on the agenda of international organisations (UNEP, OECD, the EU, UNECE, the United Nations Economic and Social Commission for Asia and the Pacific (UNESCAP), with international players at the forefront of publishing reports on the topic. Water reporting is primarily a national obligation and is mostly carried out by environment ministries, the water department in these ministries, or environment (protection) agencies. In contrast and due to the breadth of interpretation of the green economy, a wide range of actors and institutions are involved in green economy processes, often with a different role, from implementation to the actual production and/or coordination of assessments. Improved accessibility is driven by more information and reports being available on line. Nevertheless, the production of hard copies is still significant. With regard to water, several of the environment ministries and their collaborating institutions have websites providing information on water resources, water pollution and the state of water, usually in the form of downloadable publications and increasingly in the form of access to (aggregated) data and near real-time monitoring. On the other hand, the cross-cutting institutional nature of the green economy implies that there are very few, if any, points of convergence (websites or portals) where all related information can be reached and integrated. There is evidence of a multitude of assessment documents available for the two priority themes, yet policy relevance and use remains limited with many reports commissioned and produced without a clear policy demand or target focus. As the number of issues related to water management, state, trends, pressure and policies grows, so does the amount and type of information that needs to be compiled and aggregated, with some 50 to 100 assessment reports being produced annually across Europe at different levels. Despite this number, the assessment of water-related ecosystems is still weak in many countries and vulnerability, ecosystem services and restoration is not much discussed. For the green economy, a multitude of documents exist which address the various individual priority areas, broadly grouped under the two categories of resource efficiency and aspects of environmental sectoral integration. With only a few exceptions at the international level, there appears to be no national assessment which brings together in an integrated and coherent fashion all the elements of the green economy, by any definition of that term. Among the multitude of assessments available for water, redundant collection of information and incomparable results are sometimes noted; further, integrated assessments, though increasing, are not the norm and the focus tends to be largely on description rather than on analysis. Many assessments appear to be of limited use in relation to policymaking due to their focus on the ' state' of the environment rather than on drivers and responses. Assessments related to the green economy often do not clearly articulate the objectives and scope, or the key questions to be answered, and seem to follow rather than inform policymaking; although this theme would offer ideal opportunities for integrated assessment, this is only starting to emerge. Also, for the green economy descriptions focus on the ' state' of the different priority sub-topics, in particular for the more well-established or traditional areas. In some 90 per cent of cases, water assessments are based on the use of indicators, commonly produced according to standard/agreed methodologies, also at the international level; nevertheless, the data is not always updated and data gaps are frequently acknowledged in the assessments. An information system was available in only about a fifth of the assessments to support data management, data sharing, and/or data exchange. Water assessments often fit within existing legal frameworks, dedicated polices, strategies and targets. Green economy experiences a more fragmented situation is terms of data consistency, frequency and comprehensiveness, as well as with regard to existing frameworks and corresponding targets. Information and knowledge gaps also exist in a range of areas such as, for example, the understanding of the relationship between ecosystems and economic systems. However, green economy assessments have a relatively higher reliance on forward-looking modelling than water, probably reflecting its conceptual stage of development. Over time, water assessments have widened their scope as scientific understanding, data availability and policy interest have interacted; an integrated assessment process, though still limited generally, has allowed the underlying complexity of water issues to be more fully evaluated helping to frame, and not follow, the policy debate. In contrast, green economy is early in the policy cycle, but is already broad conceptually; integration, in this case, could thus mean simplifying the concept and breaking it down into its component parts to allow the policy process to tackle it practically and for the concept to be more easily assessed. There is evidence that SEIS would support the improved efficiency and effectiveness of environmental assessments, in particular, with regard to the following dimensions: (i) the generation of compatible content across themes and geographical scales; (ii) the diffusion of comparable methods for measuring progress towards a green economy and its many natural resource components; (iii) the deployment of various technologies as the information infrastructure to underpin information gathering, use and assessment processes; (iv) the organisation of and easy access to relevant knowledge, including assessments, between institutions and the public (implementation of the Convention on Access to Information, Public Participation in Decision-making and Access to Justice in Environmental Matters (Aarhus Convention)); and (v) the improved coherence in and use of assessment findings by giving better access to existing results and assessment approaches and by strengthening the web of relationships among stakeholders. This chapter presents a cross-cutting overview of the EE-AoA results around the two key themes of the Astana Ministerial Conference: Water and related ecosystems and the green economy. The chapter highlights a number of key observations about environmental assessments across the region covering commonalities, differences and limitations, institutional responsibilities, processes and content, scope for improved environmental governance, as well as applicability and transferability of the results to other themes and areas regionally and globally. These conclusions have been drawn from the analyses presented in the Water and Green economy chapters underpinned by the reviews performed on the individual assessments. While this knowledge base (available on the EE-AoA portal) represents a significant sample of the recent literature in the two areas over the past five years, the entries are not exhaustive. Consequently, there is a margin of uncertainty in the results arising from the methodology' s application given the impossibility to identify and capture in the process everything available at all scales and for all related themes and to review all of these consistently. With these limitations recognised, the assessment and conclusions presented here are believed to be robust and pertinent for the objectives of this exercise. While the water and green economy priorities covered by the EE-AoA do not cover comprehensively all environmental issues, the breadth of their scope leads to the inference that the often crowded and uneven landscape of disconnected environmental assessments observed for these issues and topics, and of related underpinning data, is a common problem across issues. Furthermore, the characteristics of the problems faced are not specific to the topics themselves but to the underlying institutional make-up and approaches in countries and organisations across the MDIAK reporting chain. The common underlying syndromes observed here present a significant opportunity for improving the knowledge support to the policy process across the environmental domain since improvements in one area, such as water, have the potential to spill over and affect others. The current diagnosis also has clear resonance with environmental assessment challenges in other geographical regions. Also globally, the results have strong relevance to the international environmental governance debate, such as discussed at the 2011 UNEP Governing Council on the World environment situation and UNEP Live (60). First and foremost, therefore, the EE-AoA has confirmed the validity of the AoA approach to themes beyond the marine environment. The strong contrasts between the water and green economy themes also underscore the potential for the AoA methodology to be applied more broadly to address environmental priorities such as biodiversity, air pollution, climate change mitigation, sustainable consumption and production and waste. Notwithstanding their strong national ties, water assessments are found at all geographical and institutional levels. In contrast, the green economy, as a theme still under conceptual debate, is mostly on the agenda of international organisations (UNEP, OECD, EU, UNECE, UNESCAP), with international players at the forefront of publishing reports on the topic. As underlined by the Aarhus Convention, 'state of environment' reports play a key role in the policy process, not only in assessing overall environmental status at national level and communicating this to multiple actors, but also as valuable sources of regular assessments on the status of water and many aspects of the green economy. Water reporting is carried out by environment ministries, the water department in these ministries, or environment (protection) agencies. In contrast, for the green economy, a wide range of actors are involved, and with it a diversity of institutions. This reflects the breadth of interpretation of the green economy at the national level, and the fact that the concept encompasses multiple sectors. This means that many different and possibly clashing priorities are involved. The multiple actors have different roles: some may be responsible for implementation within the individual sectors and others for the actual production and/or coordination of assessments. Other relevant players are international organisations and the civil society, including NGOs, the private sector, and trade-related stakeholders, as well as research and think-tanks, and multinational organisations. By making reports available online, accessibility by the general public to assessments is satisfactory, although the production of hardcopies is still significant. With regard to water, several of the environment ministries and their collaborating institutions have websites covering water that provide information on water resources, water pollution and the state of water, usually in the form of downloadable publications and increasingly in the form of access to (aggregated) data and near real-time monitoring. For the green economy, even if the information is available online there are very few, if any, points of convergence (websites or portals) from where all related information can be reached and integrated. A strong contributory factor is the cross-cutting institutional nature of the topic where many bodies, ministries or agencies are responsible for parts of the related knowledge base, something which is reflected in the paucity of integrated green economy assessments. The EE-AoA has also shown that there is a multitude of assessment documents available for the two priority themes, yet policy relevance and use remains limited with many reports commissioned and produced without a clear policy demand or target focus. For water-related topics, about 50 to 100 assessment reports are produced annually across Europe at different levels. Despite this number, the assessment of water-related ecosystems is still weak in many countries and vulnerability, ecosystem services and restoration is not much discussed. As the number of issues related to water management, state, trends, pressure and policies grows, so does the amount and type of information that needs to be compiled and aggregated. Additionally, relevant information is being produced at multiple governance levels: sub-national, national, regional and international. This geographical/governance scale level is itself becoming a significant multiplying factor. For the green economy, this multiplicity of assessment documents is of a very different nature. The information collected for the EE-AoA shows that a multitude of documents exist which address the various individual priority areas under the green economy. These broadly cover the two categories of resource efficiency and aspects of environmental sectoral integration. The many documents available for all these sub-topics under the green economy umbrella, and registered individually by the EE-AoA portal, give the impression that hundreds of reports are actually existing and available on the green economy as such. In fact, all these reports relate to elements or sub-topics of the green economy only. Indeed, with only a few exceptions at the international level, there appears to be no national assessment which brings together in an integrated and coherent fashion all the elements of the green economy, by any definition of that term. For water, many different assessments are produced, often with different purposes and not always using the available information systematically. This can sometimes lead to redundant and wasteful collection exercises and to results which are not easily comparable. Assessments related to the green economy often do not clearly articulate the objectives and scope, or the key questions to be answered and seem to follow rather than inform policymaking. 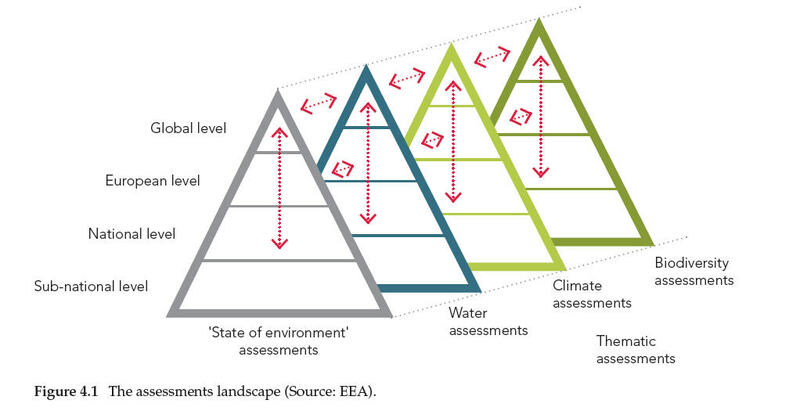 While for water, there are an increasing number of integrated assessments, this is not the norm. Reporting is mostly done on the separate topics with some cross-references if there are influences, and in many cases the assessments are largely descriptive rather than analytical. Green economy and resource efficiency would offer ideal opportunities for integrated assessment, but this is only starting to emerge. For the green economy, descriptions focus on the ' state' of the different priority sub-topics, in particular for the more well-established or traditional areas. Drivers, pressures, impacts and responses are discussed less frequently reducing policy influence. State analyses also dominate assessments in the area of water and related ecosystems. More generally the links between assessments and relevant decision-making are not evident for the green economy; there are also relatively few ex-post assessments that evaluate policy or consider how assessments have led to adoption of policies. Water-related assessments are often generally rich in statistical data but, with notable exceptions, many are of limited use in relation to policymaking since policy performance is often not provided, information is not presented in an integrated manner or indicators are not responding to policy questions and are not sensitive enough to drivers and responses. Approximately 90 per cent of the countries use indicators to describe the environmental status of water. Despite an improved timeliness of relevant water information, with data and information in the water assessments often being only a few years old, some countries have many water indicators based on old data (in some cases over 10 years old). Water-related country profiles compiled at the international level provide often rather outdated information. Further, information gaps were identified in almost halfof the assessments and in only 20 per cent of the assessments was an information system to support data management, data sharing, and/or data exchange identified. More positively, 70 per cent of the indicators used in the water-related assessments are wholly or partially produced on the basis of standard/agreed methodologies, most of which are agreed at the international level. For the green economy, a lack of consistency in the basis, format and frequency of data being collected and used to inform assessments is observed; there is an evident gap around indicators for green economy and to some extent also for resource efficiency; additionally, specific information and knowledge gaps exist in a range of areas such as, for example, the understanding of the relationship between ecosystems and economic systems. There is also a limited use of modelling and scenario tools in the assessments, thereby restricting the forward-looking component of reporting as an important aid to decision-making especially in the face of global systemic challenges, greater uncertainties and increasing risks. That being said, green economy assessments have a relatively higher reliance on forward-looking modelling, probably reflecting its conceptual stage of development. Water has dedicated legislative frameworks and regulations that do not exist as such for the green economy. Thus, while targets related to water do exist as a consequence of legal obligations, polices and strategies, the green economy has a range of specific targets related to its sub-topics and ranging, for example, from greenhouse gas emissions to energy efficiency in new housing. Taking the long view in the development of assessments, lessons can be learnt from the clear trend observable in water assessments. Early in the policy cycle, water assessments started narrow, addressing a cluster of specific issues of interest to the policymaker. Over time, water assessments have widened their scope as scientific understanding, data availability and policy interest have interacted. This more integrated approach to water assessments, though still limited generally, has allowed the underlying complexity of water issues to be more fully evaluated helping to frame, and not follow, the policy debate. Furthermore, this has supported strengthened policy insights into the interconnectedness between policy areas (water, industry, energy, agriculture, health, ecosystems, etc.) and helped contribute to the exploration and evaluation of policy trade-offs and win-win approaches. In contrast, green economy is early in the policy cycle, but is already broad conceptually. The difficulty in assessing the green economy is precisely due to its breadth and complexity, encouraged by the multiple definitions of the concept which exist. This situation could lead to an opposite trajectory of development to that of water, where the concept could be simplified and broken down into its component parts to allow the policy process to tackle it practically and for the concept to be more easily assessed. However, as assessment of the green economy is not the same as a sum of the assessments of its component parts, such a development path for assessments needs to be guarded against. Overall, the EE-AoA demonstrates the need for a system of assessments which is closely interlinked with and served by a system of shared environmental information for the whole of Europe (SEIS). There are five dimensions of SEIS development that would support the improved efficiency and effectiveness of environmental assessments: the generation of compatible content across themes and geographical scales; the diffusion of comparable methods for measuring progress towards a green economy and its many natural resource components; the deployment of various technologies as the information infrastructure to underpin information gathering, use and assessment processes; the organisation of and easy access to relevant knowledge, including assessments, between institutions and the public (implementation of the Aarhus Convention); and an improved coherence in the communication of assessment findings and related knowledge. 1. Develop compatible content across scales and themes. Assessments should not exist in isolation but rather be connected as appropriate and feasible through common approaches using appropriate types of information, agreed analytical approaches and indicators as needed. This landscape of interconnected assessments is described schematically in Figure 4.1. This captures the way that information from assessments at different levels should interact to maximise coherency, transparency and traceability of outcomes. This raises many questions, among them: Should we develop common norms and standards for data collection and transfer as well as analytical methods and indicators to facilitate improved compatibility? Some data flows (e.g. emission inventories) and indicators already exist globally, some are coming on stream soon (e.g. environmental accounting methods), while some need to be developed from scratch (e.g. methods for measuring the effectiveness of responses in making progress towards green economy objectives). 2. Use accounting methods and indicators to support water and green economy objectives. GDP is the aggregate measure of progress with the current economic model and is derived from the System of National Accounts established by the UN in 1952. Sixty years on in 2012 the UN Statistical Commission (UNSC) will be invited to consider adopting global approaches for environmental accounting that address key aspects of resource efficiency. The results of UNSC deliberations in February 2012 will be considered as part of the Rio+20 Conference in June 2012. The guidelines will address physical and monetary accounting methods including links back to the System of National Accounts, thereby opening up the possibilities to go beyond GDP by internalising the environmental externalities that result from impacts on ecosystems' and people' s health. This will in turn provide the opportunity for all countries to develop credible metrics for measuring progress towards a green economy for the next 60 years in the same way that the SNA have enabled for the current economy over the past 60 years. 3. Deploy an information infrastructure that is fit for purpose. The transition to a green economy is complex with many information strands, including huge data demands, accounts, indicators, lay and local knowledge, uncertainties etc. There are therefore many dimensions to a supporting information infrastructure ranging from sensor technologies, to enable real-time data collection and transfer, cloud computing, to enable large information sets to be managed efficiently, web platforms, that facilitate information provision from a wide range of actors, web services, that enable information to be accessible continuously to a wide range of users, web tools, that enable analytical methods such as accounts to be made available and used consistently by many actors, and knowledge clearing houses, that ensure information is collated and organised efficiently (Examples abound of established practices which could be applied in this context). 4. Facilitate networks and organisation for sharing knowledge: People networks are the backbone of a successful shared environmental information system. The pan-European region has several examples of established practice (e.g. the UNECE Working Group on environmental Monitoring and Assessment, WGEMA (61), and the Pan-European Biological and Landscape Diversity Strategy, PEBLDS (62) alongside the mandated Eionet in EEA member countries (63). For the most part, these networks support specific challenges with (to EEA' s knowledge) no examples across pan-Europe of international networks established to deal with systemic challenges. Seeds exist in many areas (e.g. UNEP' s International Resource Panel (64), while formal inter-governmental recognition has been confirmed for IPBES (International Platform of Biodiversity and Ecosystem Services (65). Assessments on such systemic challenges are a basic requirement for the policy process and need to be developed. 5. Improved coherence and use of environmental assessments. Implementing consistent assessment frameworks such as DPSIR across environmental assessments, strengthening the science-policy interface in the design, preparation and communication of assessments, reinforcing the forward-looking component of reporting and policy support, and clearer communication of assessment findings are among the main elements in play. By improving use of existing assessment results, frameworks and approaches, SEIS can help develop coherence between assessments and support how they can build upon each other. Furthermore, SEIS can improve the use and uptake of assessment results in the policy process by strengthening the web of relationships among stakeholders so that the results of the assessments are more salient, credible and legitimate. 58. See Chapter 1, Box 1.3. 59. See e.g. ' Draft decision approved by the drafting group: World environment situation' , UNEP/GC.26/CW/L.4/Add.2, 24 February 2011. 60. See e.g. ' Draft decision approved by the drafting group: World environment situation' , UNEP/GC.26/CW/L.4/Add.2, 24 February 2011. 61. WGEMA: Working Group on Environmental Monitoring and Assessment under the United Nations Economic Commission for Europe, http://www.unece.org/env/europe/monitoring. 62. PEBLDS: the Pan-European Biological and Landscape Diversity Strategy, http://www.peblds.org. 63. Eionet: The European Environment Information and Observation Network, http://www.eionet.europa.eu. 64. International Resource Panel: http://www.unep.org/resourcepanel. For references, please go to https://www.eea.europa.eu/publications/europes-environment-aoa/chapter4.xhtml or scan the QR code.